Since the closing ceremonies at the Sochi Olympics concluded, Vladimir Putin has done his best to make clear that he intends to make things as difficult as possible for Ukraine’s new interim government. First he ordered massive military exercises, involving some 150,000 troops, on Ukraine’s border. While some observers noted that not enough medical units were included to indicate an invasion, it was clearly a provocative act. Yet, even more worrying has been his actions in Crimea, a semi-autonomous region of Ukraine, which almost perfectly mirror his actions in the run-up to the Russia-Georgia War in 2008. Pro-Russian separatists, wearing military uniforms without insignias, seized government buildings, airports and communication hubs in the region. Then Russian troops were put on alert to “protect their citizens” in the area. Crimea’s new Prime Minister—himself a Russian citizen—has appealed for Russia’s help. Now, in what seems to be a false flag operation, Ukraine’s forces have been accused of attacking Crimea’s Interior Ministry. A referendum has been scheduled to decide on the region’s status. The Russian Parliament has approved the use of military force in Ukraine and to recall their Ambassador from the US. As noted above, Crimea is a semi-autonomous region of Ukraine, which means that while it is part of Ukraine’s sovereign territory, it is largely self governed. A beautiful place located on the Black Sea, with rugged mountains leading to sandy beaches, Crimea is a popular tourist destination. It is also a tricky place politically. In 1954 Khrushchev decreed that it become part of Ukraine, a move that many in Russia still see as illegitimate. Just over half of the population are ethnic Russians, a quarter are ethnic Ukrainians and most of the remainder are Crimean Tatars who, having been deported by Stalin in 1944, are fiercely anti-Russian. In 1992, after the collapse of the Soviet Unions, Crimea decided to join the newly independent country of Ukraine. Crimea looms large in Russian history. It was the site of the Crimean War fought in the 1850’s against the French, British and OttomanEmpire . Although Russia lost, the bravery of its soldiers is still a source of Russian pride, much like The Alamo in Texas. Its resort city of Yalta hosted the famous talks between Roosevelt, Stalin and Churchill. Yet Russia’s interests in Crimea go far beyond nostalgia. As important as the region is for Russian pride, as the map below shows it looms even larger in the geopolitics of the region. The naval base at Sevastopol, on Crimea’s southwestern tip, is Russia’s only warm water naval base and its primary means of extending force through the Mediterranean. It has been alleged that the port city has been used extensively to supply Bashar al-Assad throughout the current civil war in Syria. And while the lease agreement with Ukraine regarding the base remains valid until 2047, the majority of the Black Sea coastline is held by NATO allies except for Georgia on the east, which is actively seeking NATO membership, and Ukraine in the north. 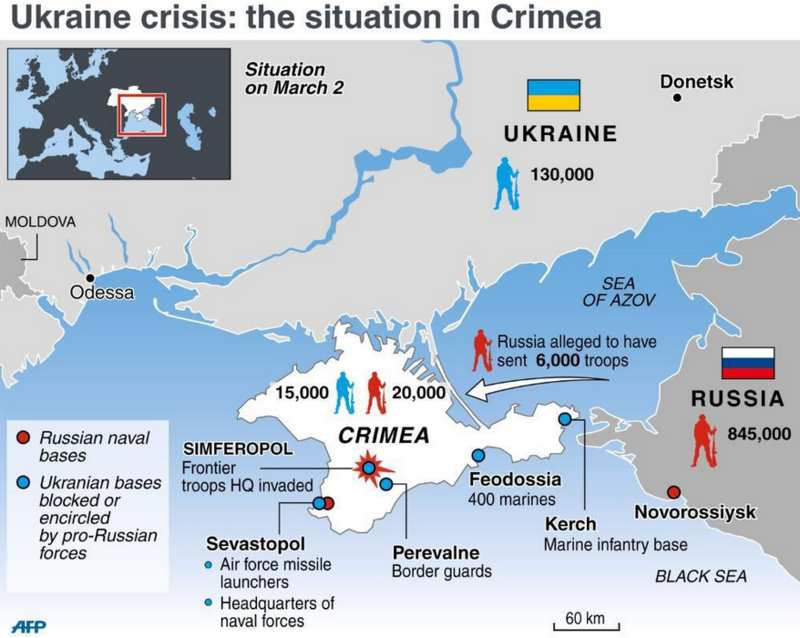 Put simply, without a naval base in Crimea Russia is finished as a global military power. Crimea, it should be stressed, is sovereign Ukrainian territory. The region chose to become part of Ukraine, it’s home to a large ethnic Ukrainian population and it’s where Ukrainians go to vacation in the summer. In effect, Crimea is important to Ukraine in the same way that Florida or Texas are important to the United States. While it’s true that many regions of Crimea, especially Sevastopol and the capital of Simferopol, are avidly pro-Russian, much of it is not. The Tatars especially do not want, under any circumstances, to become Russian citizens. There is also the matter of the 1994 Budapest Memorandum, in which Ukraine agreed to give up its nuclear weapons and Russia vowed to respect Ukraine’s territorial integrity. By violating the treaty, Putin is signaling that all agreements signed during Russia’s period of weakness in the 90’s are null and void. Unfortunately, if Putin wants to take Crimea, there’s very little Ukraine, the US or NATO can do about it. Russia has ample military assets in the area and it is doubtful that a shooting war will break out. Any free and fair referendum regarding Crimean sovereignty would be close, but Putin will surely put his finger on the scales, ensuring victory and giving him a veneer of legitimacy. President Obama held an unscheduled press conference on the events in Crimea yesterday, expressing deep concern and warning Putin that “there will be costs.” There is an intense diplomatic effort underway, involving both Russian and Ukrainian officials, as well as European allies. Again, if Putin is determined, none of this will be effective. Yet, the West is not wholly without leverage either. While it went mostly unnoticed in the American press, Obama made an unscheduled stop to Vice President Biden’s meeting with Georgia’s Prime Minister Garibashvili and expressed support for creating closer ties and for its aspirations of full NATO membership. It is this last move that may be the most significant. Russia is no longer a great power. While its military retains some important capabilities, its army is largely made up of ill-equipped and poorly disciplined conscripts, whose families lack the means for them to avoid service. In the 2008 war, Georgia shot down 9 of its planes in less than a week. 5. What Will Be The Consequences? If Putin does annex Crimea, it will surely bring international condemnation and, quite probably, some form of implicit or explicit trade sanctions. With its weakened economy, that is not something that Russia can easily afford and a downturn can be expected. If the price of oil drops 15%-20%, the country could suffer a crisis on the level of what it endured in the 1990′s. Putin will also see a military buildup in his backyard. NATO membership for Georgia, with the advanced weapon systems and training it will bring, will surely degrade Russian national security. The port of Batumi (see map above), could also serve as an important military asset. Perhaps most importantly, annexation of Crimea will mean that Putin has lost Ukraine for good. It will be a transgression that will not be forgotten or forgiven and will speed up European aid and integration. The Crimean Tatars, with their deep hatred of Russia, will resist Russian sovereignty, possibly resulting in a situation similar to the one in war-torn Chechnya. The Russian President is, in effect, sowing the seeds of conflict for decades to come. And that is what is so worrying about Putin’s latest moves. They show that he is clearly a desperate man, willing to make a clean break with Ukraine and Europe, risk an acceleration of Georgia’s membership in NATO—an event that he wants to avoid almost as much as losing Ukraine—cripple his own economy and suppress yet another indigenous population. All for little tangible gain. It appears that Putin feels that he has nothing left to lose. Corrections: In a previous version of this article I stated that Sevastopol was Russia’s only warm water port. Some readers have pointed out that it would have been more accurate to say that it is its only warm water naval base. There is an additional Black Sea port at Novorossijsk, that Russia has been trying to convert to a suitable Naval base, but hasn’t been able to do so yet. Also, I stated that Georgia shot down nearly 20 of Russia’s planes in 2008 and that probably exceeded the number of US planes shot down since Vietnam. Although there were reports of that figure at the time, the official estimate now stands at 9, which is far less than the 50 or so US planes shot down in the two wars in Iraq. Finally, I described the upcoming referendum in Crimea as deciding whether Crimea would stay with Ukraine or join Russia. While there were a number of early reports indicating that, it turns out that the referendum will be about increasing Crimea’s autonomy. However, Crimea is already largely self-governed, so it’s not clear what that means. I apologize for the errors and thank readers for their corrections. If you see anything else I got wrong, please let me know.